A security deposit is required with this reservation and we will process a credit card authorization in that amount 7 days prior to your arrival. A charge may result for damage to the condo, missing contents or for exceeding the stated number of overnight guests. Damage in excess of the security deposit will additionally be charged to your credit card commensurate with such damage. Guests are responsible for reporting any damages immediately. Cancellations made less than 30 days of the check-in date results in loss of all payments. A $250 security deposit authorization is required with this reservation and we will process a credit card authorization in that amount 7 days prior to your arrival. A charge may result for damage to the condo or contents, missing contents, excessive cleaning required after checkout or for exceeding the maximum number of overnight guests. If a guest arrives without notice earlier than the scheduled check in time of 3pm or fails to depart by the required 10am checkout time, their security deposit which is on hold will be charged in full. Our units hold very busy time lines and the failure to leave on time can cost money and schedule disasters. Likewise arriving earlier than scheduled can disrupt the busy cleaning flow, cause mishaps and confusions with the housekeeping staff. The maximum occupancy is 4 persons including children of all ages. Violations result in loss of all deposits, immediate eviction and the loss of the ability to make any future bookings at this condo. The resort charges a fee of $20/day, payable to the front desk upon checkout. This covers wifi, pool towels, pool and hot tub use, fitness center, use of tennis courts and BBQs. There also is a parking fee of $6/day per car also payable to the front desk upon checkout. Resorts that require “resort fees” for guests staying on the property solely make the decision on what the amount of the fees will be and it is out of the control of the owner of this property. These fees are subject to change at anytime without notice and could change before your arrival and could be different than the original fee stated in your reservation. We make every effort to communicate changes in fees as soon as we are notified. The resort restaurant is closed indefinitely. However the lounge/bar is open. Check-in time is 3 PM and check-out time is 10 AM. Please plan your arrival and departures times accordingly. Guests will be charged $50/hour for occupying the condo any time past their scheduled check-out time. An early check-in time or a late check-out time may be available for a fee. Beach Towels are available poolside or from the front desk during off hours. Please make sure that all keys are turned into the front desk upon departure from the unit. We charge a $25.00 replacement fee for each lost key. Air Conditioning is available free of charge. Hurricane, Tsunami or Storm Policy: No refund will be given unless a mandatory evacuation order has been given by the National Weather Service for Princeville and the surrounding area. In the event a mandatory evacuation order is issued we will refund unused portions of rent of a guest currently occupying the property and any advanced rents or deposits collected for a guest that is scheduled to arrive during the evacuation period. High-quality, expensive memory foam mattresses (Bergad) are installed in this condo. Waterproof pads are available. Please use these pads if needed. The full replacement cost of a new mattress (more than $1000) will be charged if it a mattress needs to be replaced due to guest negligence. Smoking is strictly prohibited at the resort, in the condo or on the condo lanai and doing so will result in full loss of security deposit & immediate eviction. Hanalei Bay Resort is a non-smoking designated resort. No pets of any kind are allowed and violation will result in loss of all deposits and immediate eviction. My family stayed in this property for 4 nights. I wish we could have stayed much longer. This is actually two adjoining units so you get two full baths, two large rooms (one like a standard size hotel bedroom and one which is all comfortable living area with a pull-down murphy bed)and two lanais. You also get a washer &amp; dryer, full kitchen area and tons of extras. It's fully furnished with all the amenities one would need in the home. Plus there's a great collection of videos, games and books and CDs. There are also beach/pool toys and a cooler for use. The view of the falls is beautiful and peaceful. It's just a short path to the awesome pool. Very quiet and private. The unit is absolutely clean and very well kept. I'm an arachnophobe and I never saw one bug and believe me, I was looking! I really can't say enough about this place. I saw other "rental" units in the complex and this one simply outclasses them. We were forced to make some late schedule changes and the owner was very accommodating and couldn't have been more understanding. I'll be back! The most private and serene condo at the resort. Once inside this spacious condo, you'll feel like your staying in a remote residence with views of only jungle and mountains. Located in the Smallest Building at the Resort You Feel Like You have the Hanalei Bay Resort, if Not the Entire Island of Kauai, To Yourself. Southern Facing - Sunny All Day! Fully Equipped Kitchen - It Has Everything! Entertainment Center with 26" HDTV, DVD, VCR, CD Player and Stereo with 5 Speakers. Isoform Viscoelastic Memory Foam Mattress - The Best Available! Combination of condos 1557 and 1558. 1-Bedroom / 2-Bathroom Suite with Kitchen, Living Room, Dining Room, Laundry and 2 Separate Sleeping/Living Areas - over 1100 square feet of living space. The condo location is the most private at the resort. It is also very close to the front desk, main pool, tennis courts, parking and restaurants. We were beyond happy with the condo. Originally we wanted an ocean view location, but having the view of the lush mountains was amazing. The beds (mattresses and linens) were extremely comfortable. The condo was immaculate and had everything we needed. We loved our stay at Hanalei Bay Resort. Our experience at this condo was terrific! Very clean, spacious, and well-appointed, and, a gorgeous view of the mountains from both patios. Entirely satisfied with our stay here and would not hesitate to return! Thank you! This was an ideal place to stay for relaxing on Kauai, the condo had everything we needed, including beach chairs, buckets, spades etc for the kids. It was clean and spacious and was only a short walk to the beautiful swimming pool. Walking distance from the resort beach where you can watch the sunset and swim. My only gripe (and this was nothing to do with the condo) was that the resort had no on site bar or restaurant, I understand that they are currently being renovated, however when I booked the condo I thought the restaurant would be open by summer 2015, however this was not the case. Don't get me wrong, it didn't spoil the holiday, but was just inconvenient, especially when you have kids who do not want to leave the swimming pool to go grocery shopping or drive to a restaurant. Once the renovations are completed this would be my perfect holiday destination. We stayed at the Hanalei Bay Resort for 4 days and couldn't have been happier with the resort and the condo. The view of the mountains and waterfalls from the lanai were awesome. The grounds and scenery of the resort as a whole are amazing. Very picturesque. Even though it rained most of the time we were there, we still managed to enjoy a couple sunsets sitting on the bluff overlooking Hanalei Bay. The beach is a short walk down the hill and they have golf carts to take you if you don't feel like walking. One thing to note, you don't need an umbrella at the beach since there is a lot of shade. We didn't realize this and got sold an umbrella at the rental desk. We had our 20 month old baby with us and found the resort to be very kid-friendly but not overrun with kids. We requested a pack and play and high chair which was set up in our room when we arrived. The condo had kids beach toys, boogie boards, tennis rackets, a cooler, beach chairs among other things. Overall, I highly recommend condo 1557-58 and Hanalei Bay Resort. We rented both units, 1557 and 1558, which worked well for us. 1558 has a full kitchen and a washer/dryer, both of which we wanted. 1557 provided us with an extra bedroom and bath, which we like (older married couple). Also, renting the extra 1557 unit ensured more privacy and quiet. The units are on the top floor and have an unobstructed view over a valley to the green Kaua'i mountains and a few very distant houses. One has a feeling of great privacy, although if the guests below or in the next building were noisy one would hear that. Other than that, it is just bird song and roosters. Both units had comfortable and attractive furniture and felt homey. The kitchen was well appointed. I was not able to connect to the aloha Condos Wi-Fi, even with the owner's help, but was able to connect with the Ethernet cable provided with the router. Overall, the condo provided us well with our needs, was comfortable, and had this Hawaiian ambiance including the lovely view. We enjoyed our meals on the lanai even when the trade winds were somewhat noticeable. If we return to Kaua'i, we would like to stay at this condo again. This place is amazing. The view is spectacular. The condo is equipped with everything you need and more. It is 5-10 minutes easy walk to a wonderful beach where you can snorkel and swim with large sea turtles. Don't hesitate to rent this place for your vacation. So much better than a hotel. I will gladly answer any questions one might have about this place in private email conversation. Do not hesitate to contact me. From the pictures it seemed like the unit was very small and space would be tight. But, we left the murphy bed down the whole time and there was plenty of room to walk around. The kitchen in the 1557 unit has everything you need and more. Beautiful views from the balcony of the mountains. Birds visited our table every morning. Beach is a little hike away, but all you have to do is call front desk and in no time someone comes in a golf cart and takes you there. Washer and dryer in 1557. Super convenient since we went hiking and came back with clothes full of red mud. The resort staff are super nice and always available to help. These are privately owned units so I was a little skeptical about being able to get a hold of the owner during my stay. But, the owner was always available either by phone or e-mail to answer all our questions. Only thing I didn't like was that this units limits stay to 2 people. Initially it was 2 of us, and at the last minute my sister decided to join. Thought I would only have to pay extra for her, but we had to rent the unit adjacent to it 1558. That unit is more like a hotel room with a mini fridge, toaster oven and microwave. It ended up being a blessing but it did cost us more. Another thing to have in mind is that since this is a privately own unit there is no housekeeping service. It was not a problem for us since I usually ask not to have housekeeping service. The resort is located in the north side of the island. Most things are in the south so location in that sense is not best. But, the beach at this location is much nicer and the area is very nice and quiet. The island is not that big. So distance wasn't too much of an issue. What a beautiful well kept condo! We have stayed at Hanalei Resort many times and this was by far the best condo we stayed in. The view was fabulous, it was private and serene, with only the birds chattering away. It was the best vacation we have had in many years and this comfortable wonderful condo helped make it so! Mahalo! ps. I am already planning my next visit!!! Jim,We love your condo! You have all the comforts of home which include a complete kitchen with spices and very comfortable bed. We appreciate having the washer/dryer with provided detergent. Thank you for the Welcome bag with delicious coffee and chocolates. Thank you for the golf umbrella and ponchos which we made great use of! The location is perfect!We loved walking down to the beach. We were only disappointed that due to the weather we were not able to go hiking along the Napali coast or to take the Napali Sea Breeze tour due to the choppy water. We had a relaxing time and enjoyed every moment. Thank you for allowing us to stay at your condo for the 2nd time. We will certainly look forward to our next time!!! Location. Location. Location!!! We stayed in this condo for a week - it was ideal for us & exceeded our expectations. It was spacious, comfortable & well-equipped, with a fantastic view & lanai. Spent many hours relaxing on the lanai with morning coffee or late afternoon "happy hour", looking out at the jungle and listening to the birds. Less than a 10 minute drive to a shopping plaza with full amenities. Loved this part of the island and all it has to offer. Hope to return some day! My husband and I stayed in this condo for a little over a week. It was perfect! Two full bathrooms, in-unit laundry, and all the conveniences of home. The balcony spanned the entire mountain side of the unit and had an unobstructed view of the mountains. The pictures didn't do it justice. Having the kitchen was very convenient. The location was also convenient. Close to grocery stores, coffee, beaches, and tons of activities. We will definitely be back! the condo was comfortable with a beautiful view. especially loved the lanais. some lightbulbs were dead in the bathroom. the dvd player was dead but otherwise it was fine. Thank you for your review - I appreciate the feedback. We've replaced the burned out halogen bulbs in the bathroom. They were a special order from the mainland and it took longer than expected to get them replaced. We now have extras in stock. We just checked out the 2 DVD players and they both worked. We wish that you had called us during your stay so that we could have helped get it working for you and we are available 24 x 7 to help every day of the year. Just call the number that we provide in the condo and in your check-in materials. Again, thank you for your review and staying with Aloha Condos. Condo was well maintained and the kitchenwell equipped. We had a very omfortable stay. Our family of four stayed in Condo 1557-58 at Hanalei Bay Resort in September 2010. The location is fantastic andthe space was extremely comfortable. Sitting on the lanaiwas wonderful - overlooking the "jungle" with lots of birdsand wildlife. We will definitely stay there again. My husband and I thoroughly enjoyed staying at this beautiful condo on Kauai. Jim did a wonderful job of giving us all the information we needed about the condo, including check-in information, driving directions, etc. The condo was very clean, comfortable and secluded. We would choose this condo to rent the next time we visit Kauai. We enjoyed using the beach chairs, umbrella & towels for our visit to the various beaches. Thank you also for providing the pack 'n play for us to use when we babysat our grandaughter while our kids went scuba diving. It was truly a relaxing and fun visit to paradise. Arrived to a nice little welcome package. Thankyou Jim.The unit was clean and well equipped. The a/C was a nice touch as it did get very hot and humid. Loved the pool area and grounds. Will definitely come back again another time.Susan and alexI must say that we had a problem with an appliance and I think there was a replacement 3 hours after we emailed Jim, thats great service !!! My husband and I recently stayed in Hanalei Bay Resort Condo 1557-58 for our honeymoon. We loved the HBR and the location. Last time we were in Kauai, we stayed further South. We loved staying further north. It was easy to get in and out of. Our condo was beautiful! It was clean and had everything we needed. We were so excited when we discovered the beach chairs in the closet, we toted them everywhere! Perfect for the two of us! The view of the mountains and Bali Hai was beautiful! We spent a lot of time on the Lanai, it was awesome! The pool at the condo was great. The staff was friendly, we really appreciated them driving us to and from the beach. It is a long, steep walk. Overall, we loved and would consider both the HBR and 1557 & 58 again! Hard to believe that the calm and peaceful balcony is in a busy condo complex. All of the owner's touches, from the packed welcome basket to the detailed, organized "hints" book, are offered with caring and generosity. He clearly cares about this well-maintained property and must enjoy making other people happy. When we come to Hawaii we love to get close to nature. Jim's condo at the Hanalei Bay Resort, unit 1557-58 is perfect. The amazing birds softly wake you up in the morning and you are refreshed and ready for the day. Kristen the local contact was available when we needed to know where to get groceries (just up the street, btw) and the AlohaCondos.com website was easy to use when we booked. My wife loved the jogging around Princeville and my daughter loved the beach down in front of the resort. The full kitchen was great so that we could prepare all of our meals there and we spent a lot of time on the lanai for meals and to watch/listen to nature. Thanks Aloha Condos and Jim for a great vacation. So peaceful and beautiful... We felt at home from the moment we walked in. The view from the lanai feels like your alone in your own private rain forest. If you see Carl the Cardinal or Gary the Gecko (Gary hangs out around the counter) Tell them we said aloha! Couldn't have spent my birthday better! Our condo was perfect! It was clean and spacious. The service, with the exception of having no restaurant, was excellent. Uncle Mikey was most helpful with a great sense of humor. Previous to our trip Jim was most helpful in answering questions since we had never been to Hawaii before. The resort was very nice; we were not disappointed, although again we would have liked a restaurant. If I travel to Kauai again I may stay somewhere with more of a central location unless I plan not to drive as much as we did in this trip. We thoroughly enjoyed all the tours and hikes we went on and various beaches we visited. We enjoyed our stay tremendously. WE had an A+ vacation time @ this condo in Hanalei. Jim the owner really goes out of his way on welcoming us w/ a basket of goodies. (coffee,chocolate,etc). It was a very nice touch. There were also plenty of spices in the kitchen,papertowels which we would normally buy if staying in the condo. The kitchen is well equipped.The condo has modern, nice furnishing w/ gigantic fans in the living room & bedroom,flat screened tv & beautiful lanai (balcony) facing the mountain view. The service at the resort was great. We enjoyed our dinners & entertainment @ the restaurant. The resort is close to Hanalei town where all the nice restaurants are & ofcourse the Hanalei Bay. As a timeshare owner, we have seen a lot of places everywere in the world & we like everything about this place. We already booked to come back in May 2010 for 2 weeks. Jim has done a superb job in anticipating our needs with tons of little extras. The gift basket was a VERY welcome touch and helped while we oriented ourselves. Little things like dishwasher and laundry detergent, beach chairs, towels & mats, lots of linens, games and video library, and a very useful little library helped. The information folder/binder was immensely helpful and something we'd not seen before. The bedroom setup was excellent. We could sit in bed and watch the flatscreen TV or just enjoy the view. Beautiful lanai that we didn't use nearly enough! In-room laundry and a second bathroom came in very handy. Beautiful well thought out decor with just enough kitch to bring charm and that "lived in/loved" feeling while being remarkably clean and uncluttered. We had almost no daytime rain until the next to last day when a tropical storm hit the North Shore dropping 17 inches of rain in Hanalei in 24 hours. Thank God we were on the Princeville side of the Hanalei bridge which got washed out. All of this in the middle of a beautiful resort with tons of amenities and a incredible private beach walk at remarkable value for the money. It was an incredible way to start to our honeymoon. We'll definitely be staying here again. Service from the owner, Jim, was prompt and friendly. The condo is large, clean and very comfortable with everything you need. Plenty of space for a family of 3. Beach chairs, coolers, boogie boards and towels are all provided with the unit as well as a fully stocked kitchen. This unit has a mountain view which is very tranquil and amazing. The Hanalei Bay Resort is great for relaxing and offers plenty of options from the huge lagoon style pool, beach, tennis courts and golf. The staff is very friendly and accommodating. HBR is a little tricky to find if you are arriving at night. The North Shore of Kauai is lush and beautiful and being 5 minutes from the town of Hanalei is great plus there are plenty of beaches nearby to explore. The Princeville shopping center is right up the road from HBR, so groceries, gas and anything else you may need is close by. I look forward to returning. We had a wonderful vacation in Kauai, staying at this perfect condo in Hanalei Bay Resort. We arrived after dark and when we woke in the morning the view was breathtaking! The view, the privacy, the accommodations were just what we wanted. The condo has everything, with the most comfy beds ever. The location couldn't be better, close to all the wonderful beaches on the north shore and the hike of the Napali Coast. We discovered Hideaways Beach, which turned out to be our favorite. There were lots of fun restaurants nearby, but our favorite was one night at the Happy Talk Lounge. Great food, drinks and a band we could have listened to for hours. We will definitely be back and will plan to stay here again. Thanks to Jim for allowing us to stay in this great place! I booked this condo just based on what other people have to say and my family loved this place. This unit is in great location. Spectacular view of the mountains and waterfalls. You can't see your neighbor just the way the units are set up. We felt like being home in this condo. Everything you need in term for the kitchen and the beach this unit has. The only downside I have about the resort is the location of the BBQ grills. It's very far from this unit. The grills are very old and did not cooked well. Awesome condo and view - indescribable in person!!! Luxurious condo with cathedral ceilings, high-quality appliances, entertainment system, A/C, furnishings, well-maintained, with a peaceful paradise feeling, with a huge view of the mountains and forest canopy. Impressive interior designing. Bright stars from the lanai at night!!! The only complaint is the resident rooster(s) who makes announcements throughout the day amid the other tropical birds which can be irritating to one who is trying to rest or want to focus on the other birds who sign rather than cockle doole doo. Other than that, this is the best alternative to an oceanfront condo. This resort offers everything you need to enjoy your stay in Princeville- great service, a fun bar, beautiful landscaped grounds and pools with great views of Hanalie Bay and surrounding mountains. This unit in particular must be one of the best in the resort. It's very close to parking and check-in (minimizing walking), yet very quiet and very private. The unit is well furnished and has plenty of balcony space for dining and relaxing while looking at spectacular views of the mountains. There is not a more beautiful place on the planet!! And the condo was perfect. When my wife and I first arrived we were immediately impressed with how generously accommodating the condo was--fully furnished and equipped and beautifully decorated. We felt welcome and at home. It was as if our best friends had made their own place available to us. One thought we had was, "It's too bad we didn't bring the kids." The next morning, however, as we lay in bed and gazed through the wall of windows at the stunningly beautiful view we were so glad to just relax and not have restless kids saying, "So what are we going to do?" It was tempting to go nowhere on the island other than the condo. Just a short walk to the beach, tennis courts, pools, restaurant, close to a grocery store, and just a short drive to spectacular sites. This is a perfect place for a peaceful getaway for a couple, an individual, or even a family. Our family stayed 4 nights at HBR Condo 1557-58 and wished we could have stayed much, much longer. The owner Jim has put together a simple and cozy place, with thoughtful touches everywhere to make clients feel welcome and comfortable. A helpful guide book, beach amenities, assorted board games, fully equipped kitchen, excellent linens, the list goes on and on. The condo itself is well situated on the resort, not far from the reception area or pool, and has a breathtaking view of the mountains and rainforest. Great terrace from which to admire the view during morning coffee and evening cocktail. It's quiet and well insulated from outside noise...apart from the ubiquitous kauai rooster, that is. Great location, easy to get anywhere on the North Coast. Mahalo to Jim for sharing his wonderful place in paradise. When we arrived at the Hanalei Bay Resort, we knew exactly where to go so proceeded to our condo. As we live on the south shore of Kauai, we came up weeks prior to our visit to do a preview. The double end unit was quiet and private, which worked out perfectly for us, since we had massages scheduled on the outside lanais. This condo worked out great for the three of us; my husband and I took the master and our niece slept on the murphy bed. We each had our own full bath which was so convenient. The one issue we did have, was the master bath fixture in the shower. It was very difficult to use and get the temperature right, without a lot of fiddling around. The kitchen was very well equipped and had all the cooking utensils we needed. It even had a spice rack, but we were a bit disappointed not to have any salt or pepper. The other complaint we had about the kitchen was the overhead light. It was so hot that we could not use it while we were in the kitchen. Perhaps replacing the bulb with a CFL would solve that problem. Overall, we loved the unit and would stay there again if the opportunity should arise. The bath fixtures in both showers have been replaced with new fixtures and shower heads. I've also re-caulked the tub in the master bedroom side. There is now salt & pepper in the condo as well. This is the first time that I've had a complaint about the light in the kitchen - it's a 100 watt halogen. We've recently replaced a dimmer switch with a regular switch because the switch was in the way of the refrigerator door. I didn't find it hot while living there six months but if I continue to get complaints I'll put in a dimmer switch again. The kitchen now has a new very high-end (according to my plumber!) faucet as well. Amazing condo, amazing resort. Would definitley stay there again. Pefect location! This was my family's 2nd stay at this condo and it was lovely. We appreciate the comfort and all the amenities provided, esp the boogie boards and coolers. It's too bad the resort's restaurant and lounge are closed but hopefully they will re-open before we return again. My son loves the murphy bed; much more comfortable than a sofa bed. The new washer is very large and we love having 2 bathrooms. Thanks for a wonderful stay. The Hanalei Bay Resort Lounge (Happy Talk) is rumored to be re-opening today (July 11, 2009)! Rumor also has it that the restaurant is going to be opening within a month. The indefinite closure of the restaurant and lounge at the Hanalei Bay Resort has been clearly stated on the Aloha Condos Website resort and condo pages since December 2008. This guest booked in February 2009 and I am sorry that she didn't know about the closure. The remainder of the resort continues to be maintained and this is the first comment that I've heard to the contrary. When I lived in my condo from July 2008 - February 2009, the level of resort maintenance was the same as I had seen since I bought my condo in 2000. * Update: The Resort Restaurant and Lounge are scheduled to re-open in 2014. ONe of the most lovely places I have ever stayed. Condo was well-maintained and had the most beautiful view from the master bedroom ever. The view was next best to an on the beach ocean view. No residents or buildings blocked the serene view. The condo was roomy for 3-4, very clean, bed was very comfortable and private from other room. The beach was a hike. preferred a beach in the next town over. Beautiful vistas views from our balcony. Right on the beach. This unit had every amenity known to man, all the perks a person would need or want. My husband and I still talk about our stay here even 8 years later. We would recommend this place and this unit to everybody. And we would love to stay here again if we ever make it back to the islands again. The people we dealt with were very accommodating as we had a specific 3 day window to stay here and everything worked out perfect for all involved. Thank you so much for the romantic 3 days your unit gave my husband and myself. We had a really nice stay in this spacious well-fitted out condo. The owner has clearly gone to a lot of trouble to make everything as easy as possible, with everything well setup and lots of thoughtful touches. Very scenic view of Hawaii, with cute little birds often hopping on to the private balcony to check us out. And of course a top location, just moments away from all the good stuff. We stayed at this condo with our two young children. The condo is in a great location: close to the pool and restaurant, and it's very quiet and peaceful. The furnishings are very nice, and our kids loved the Murphy bed! The Hanalei Bay resort is a wonderful resort; the only complaint was the temperature at the main pool was freezing! But the grounds, pool, and small kids sandy area of the pool are just gorgeous. It's nice to go to the Princeville Resort beach, just down the path. I would highly recommend this place, especially for the value. You can't rent a condo for this price in Hawaii and get this level of quality or location. We have been to the various Hawaiian islands several times but had never stayed in Kapalua. We found the condo through www.vrbo.com, and it was without a doubt the nicest, roomiest, cleanest and most well-equipped condo we have rented so far. I'm sure we'll go back again. Highly recommend! Very comfortable and well appointed. This unit affords a spectacular view of the forrest and mountains. The lovely leni is private and very enjoyable after a day on the beach or sight-seeing. Incidently, the resort has a magnificant "natural" swimming pool and oustanding, out-of-doors hot tub.The beach at Hanalei Bay Resort is wonderfull and is very suitable for wading, swiming and scuba diving. The apartment was spacious, well stocked with dishes, towels, beach toys, etc. We had to buy our own salt and pepper, butter, etc., but there were a few more "exotic" spices. For the price, it was a great deal, lots of amenities, and of course, Hanalei as always was epic. Beautiful. lush tropical vegetation. Beautiful spacious comfortable condo. Top notch facilities--food, drink, swimming pools...and a very secluded, gorgeous beach. Very close to picturesque, quaint "downtown" Hanelei Bay, and more beaches and hiking to still more breathtaking vistas. Bring binoculars! Spectacular views abound. Waterfalls, Bali Hai sunsets...Paradise. It has been awhile since our stay, but I remember being very pleased with this unit. It was decorated beautifully and had everything we needed. Listening to the birds on the lanai was soothing and the view of the tropical plants and trees was spectacular. The beach was probably our favorite. Great spot for our son to play. It does rain alot on this side of the island, we spent a few days hanging out in the room. Warning...the mosquitos are baaaddd! We ate in the restaurant one night and were attacked by the lil creatures. Overall it was a wonderful experience and would love to go back. We love the indoor/outdoor ambiance of the hotel lobby and the lushness of the surrounding countryside. This was our second visit. The condo is an end unit, was nicely furnished, convenient to the central area, but not exposed to noise from the public areas. We would return to this location if we visit Kauai again. The owner was easy to deal with and seems to be oriented towards customer service. Wi-fi service worked well. This unit has a spacious feel inside because of the lay-out. I felt that the unit was a great value for the price when I compared it to other similar units. This place was actually even more reasonable than most units in Ocean City, Maryland near our home (way over priced any more). The view out the deck is quiet with a great garden and mountain view that adds to the private feel of this unit. The Hanalei Bay resort location is an excellent amenity. The only slight drawback was that we wished it was a little closer walk to the beach, but you can't have it all at this reasonable of a price (it is about a 10 minute walk down the step paved path to the beach). Overall, an excellent value for the price and amenities. Our stay was perfect. I could not think of one negative to write about. The rental itself was clean, cozy with all the comforts (and more) of home. I was a bit nervous renting "in the dark" and could not have been more pleased. The resort was beautiful, the ower was pleasant and accommodating. The unit itself was spacious, the beds comfortable. We enjoyed sitting on the balcony every morning and listening to the sounds of Kauai. I might also mention some friends of ours rented a unit in the same building and were very impressed with our accommadations. They even paid a much higher price than we did. THis IS the place to stay and hope that we will be able to return one day. My wife and I enjoyed this condo and our total vacation experience at Hanalei Bay Resort. The unit is furnished with everything you need and gives you a feeling of living at home. The view of the mountains from your lanai will stay with you long after the return home! We stayed in this wonderful condo in last June. The condo was very clean, well equipped and a good location within the resort - close to the tennis courts, main pool and front desk area. It had a well stocked kitchen, and we cooked several nights. The owner thoughtfully provided many videos for the two TVs, beach equipment to use, and had written very thorough island guides for his guests. As we were traveling with our two teenage children, we really enjoyed having two rooms and two baths. The Hanalei Bay Resort was beautiful and very well maintained. We enjoyed the beach, tennis courts, and pool. We also enjoyed the view of waterfalls from our two balconies. This part of the island was not as crowded as the southern end, which was nice. We would definitely recommend Hanalei Bay Resort and this particular condo again, and look forward to coming again ourselves! We really enjoyed the facility and the condominium. I would highly recommend it and would use it again. I love staying with Aloha Condos. The rooms are beautiful and the views are amazing. It's like a home away from home. The first time I visited Kauai, I stayed at the Hanalei Bay Resort and paid resort prices for the rooms. I stumbled upon Aloha Condos when planning my next visit and discovered a hidden gem. The rooms are much nicer and seem more like home than the normal hotel rooms. The prices are very affordable as well. I don't even think of staying in a different place when I plan a Hawaiian vacation. I always think about Aloha Condos first. I've stayed in several of the units in Kauai and have also stayed in one of their units on the Big Island. They are all very clean, very nice, and again, a home away from home. Hanalei Bay Resort is beautiful and we loved the condo. It was comfortable, very clean and air conditioned. Full kitchen and washer and dryer were also nice to have. It was a peaceful and quiet location to come back to after a full day on the beaches. The pool and grounds at HBR are very tropical and beautiful. We spent a wonderful week at the Hanalei Bay Resort on the north shore of Kauai. The condo was more than we expected. The furnishings were beautiful and the condo was supplied with every detail a person could want. It was so nice to have two full bathrooms!! !Hanalei Bay Resort is one of the most beautiful places in Hawaii. It's a magical place and we will definitely be back. I highly recommend renting from Aloha Condos. We found your beautiful condo after much searching on the web. Contact and arrangements were easily accomplished via email. Upon arrival, Jim had a great welcome beach bag (reusable) filled with goodies in his fully furnished, wi-fi condo. Jim had thought of everything from games to movies, pool toys to kitchenware and spices. We timeshare travel a lot and the fully stocked nature of this condo was the best we've seen by far! It was perfect for us as a couple with easy access to the rest of the island and breathtaking views of the mountains and waterfalls. We couldn't have asked for a better place to stay and have recommended Jim's condo to several friends since our visit. My family stayed in this property for 4 nights. I wish we could have stayed much longer. 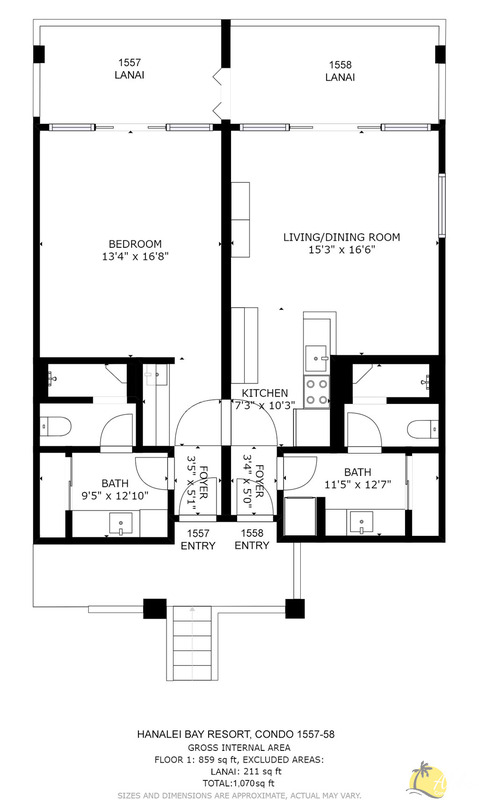 This is actually two adjoining units so you get two full baths, two large rooms (one like a standard size hotel bedroom and one which is all comfortable living area with a pull-down murphy bed)and two lanais. You also get a washer & dryer, full kitchen area and tons of extras. It's fully furnished with all the amenities one would need in the home. Plus there's a great collection of videos, games and books and CDs. There are also beach/pool toys and a cooler for use. The view of the falls is beautiful and peaceful. It's just a short path to the awesome pool. Very quiet and private. The unit is absolutely clean and very well kept. I'm an arachnophobe and I never saw one bug and believe me, I was looking! I really can't say enough about this place. I saw other "rental" units in the complex and this one simply outclasses them. We were forced to make some late schedule changes and the owner was very accommodating and couldn't have been more understanding.I'll be back! I have been to Hawaii atleast 30 times over my lifetime and this condo, location and destination are my favorite! The condo is clean, secluded, spacious, romantic and has very ammenity you could imagine. Beach chairs, towels, boogie boards etc. I have stayed there twice now and sent my son and his girlfriend and I hope to go back in 2009 inspite of the recession!!! The condo was very clean, well-furnished, and convenient as it was just steps away from the Bali Hai Restaurant that sports spectacular views. The view from the room faces the mountains which were replete with distant waterfalls. The owner Jim was very courteous and professional. Overall, we enjoyed our stay and will definitely consider returning.